Comprehensive review of Trish McEvoy Beauty Booster Advanced Repair Retinol Eye Cream. See how this retinol cream compares against other wrinkle creams! Overall I really like this Trish McEvoy eye cream! I noticed results for sure. My dark circles faded, my puffiness was diminished and my crow’s feet greatly improved! I think that this is also a great preventive product. I didn’t realize how much I needed it until I started using this particular cream. First, I disliked the irritation I experienced the first 5 days that I used this product. It’s common to experience redness and irritation with retinol products, however because it was near my eyes, it bothered me more so than other parts of my face. The blurred vision and itchiness was a huge concern, however it did go away with time. I would just watch out for it, especially if you have sensitive skin. Second, the price tag is over the top! This is by far one of the most expensive retinol products out there and can become a very costly habit. However, it does go a long way, so once the initial sticker shock wears off, you will not need to repurchase for a while. This Trish McEvoy Retinol Eye Cream is a clear, super lightweight substance. Even though it’s labeled a cream, I wouldn’t exactly quantify it as one; it has the texture much more of a gel, or even a serum. It feels like velvet when you pump it out of the tube. One of my favorite things about it! Applying this retinol eye cream is simple. After you cleanse your skin, you apply a thin layer underneath your eyes only. It’s super important to pat this product in versus rubbing! Now the directions on the bottle are to apply every morning and night. This is odd to me, because retinol products are only suppose to be used in the evening because the sunlight can deactivate the potency and cause more irritation. Trish McEvoy Retinol Eye Cream dries super quickly! Even though it has a velvet like texture to it, which could cause it to be greasy, it dries so fast, and you never know it’s on your skin! This product truly is 100% fragrance free. It is almost like applying air to you face. After waking up the next morning after using Trish McEvoy Retinol Eye Cream for the first time, I noticed a few things. I tend to battle eye puffiness and dark circles, even after a good night’s sleep, and I did appear to look much more “well rested”. However, my eyes were super irritated. They were red and itchy, and my vision was slightly blurry for a little bit (YIKES)! Overall, I liked what I saw, but the initial side effects did concern me. Longer term, I did notice some great things to my eyes. The irritation only lasted the first 5 days, which was good! And my eyes really did appear to look better. I was starting to notice some crow’s feet (those annoying lines around your eyes) and after using this product they are much better! This cream contains retinol; however, the actual amount is not stated. The retinol in this product is used to help tighten your skin and help with lines which I did notice. Now I never heard of resveratrol before using this product. Resveratrol is a plant compound and is considered an antioxidant. Its main use in skin care products is to help repair your skin and also serve as a prevention aid. Probably why my newly discovered crow’s feet went away so fast! A half ounce tube costs an EXTREMELY expensive $125.00, which makes a one ounce tube $250.00. Obviously, the price can be a huge deterrent! Granted, you are covering a very small area only applying it under your eyes, so it does last longer than “all over” retinol products, but it’s still a huge price tag to swallow. Trish McEvoy does offer a satisfaction guarantee. A full refund is given if the product and receipt is returned 30 days from the purchase date. Keep in mind if any free gift with purchase is included, they must be returned as well, or you will be deducted for them! 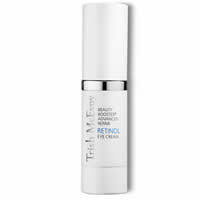 To buy Trish McEvoy Beauty Booster Advanced Repair Retinol Eye Cream, click here. Texture/Feel This is a clear, super lightweight substance; it has the texture much more of a gel, or even a serum. Application After you cleanse your skin, you apply a thin layer underneath your eyes only. Drying Time This eye cream dries super quickly. Short Term Results I appeared more well rested, however, eyes were red and itchy and vision was slightly blurry for a bit. Long Term Results Irritation lasted first 5 days, but eyes really appeared to look better after that. Guarantee Yes, a full refund is given if the product and receipt is returned 30 days from the purchase date. Price It’s $125 for 0.5 oz… extremely expensive!